The Talmud says that embarrassing people in public is like spilling their blood, yet it's one of the many forms of emotional homicide that are common in the workplace. The authors want the killing to stop. 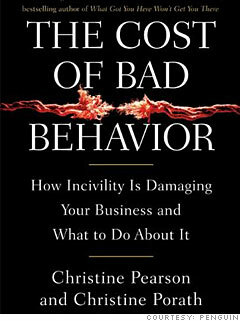 They make an earnest case that incivility on the job can wound your company by demoralizing workers and driving off customers. The book even offers a worksheet to help you put a dollar value on the problem. Don't bother. Workplace nastiness can't do anyone much good, including business owners. Take Pearson and Porath's sensible advice for heading it off and rooting it out. Doing so will make you richer or, at the very least, let you sleep the sleep of the just.